Karen Blixen remains a complex figure in the writing and history of colonial Africa. Author, storyteller, and early colonizer, she helped to define Africa and its people for the many Europeans who read her novels, chiefly Out of Africa and Shadows on the Grass. Criticism of her work frequently shifts from admiration of her form to outrage at her portrayal of Africans. Karen Blixen’s complicated life and work continue to be studied, debated, and questioned in light of both the colonial society she inhabited and the modern reality of a postcolonial world (see Victorian Women Travelers in the 19th Century). Born in 1885 fifteen miles north of Copenhagen in Rungstedlund, Denmark, Karen Dinesen grew up on her family’s spacious estate and led a somewhat typical aristocratic life. Her father, Wilhelm Dinesen, fought in the Prusso-Danish war in 1864, and later lived in the United States for two years amongst Native American tribes. In 1895 when Karen was ten years old, Wilhelm hung himself, leaving his wife to raise five children alone. Although Karen knew little of her father, she often claimed to identify most with his family and his sense of exploration. In comparing her life in Africa with her father’s time in America, Blixen comments, “he turned away from Europe and its civilization and lived for three years among Indians in North America without seeing another white man” (Hannah 13). Much of Blixen’s early life consisted of what she describes as an unhappy childhood amidst strict Victorian sensibilities. Schooled at home with a private tutor, Blixen did not fit well with her family’s expectations. Blixen even contends that differences with her aunt became “one of my main reasons for going to Africa” (15). Because of this unfulfilled childhood, Blixen quickly turned to storytelling as a source of comfort–a practice she repeated later in life (Hannah 17). She began writing at the age of eight with the frequent stories she told to her sisters. Blixen published two stories in 1907 and another in 1909 in Denmark; all three were ghost stories with women as their protagonists. As a young woman, she attended a school of design in Copenhagen, and later the Danish Royal Academy of Art. Years later, Blixen cited her training as a painter as a major influence in her work. Commenting upon her work, she says, “painting has constantly revealed the true nature of the world to me. I have always had difficulty in seeing what a landscape really looks like unless I have been given the key to it by a great painter” (21). This affinity for rich description became a frequent thread in her writing. In 1914, Karen Dinesen married her Swedish cousin Baron Bror von Blixen-Finecke and moved to Kenya with him to start a coffee farm in the Ngong Hills. She passed in 1962 after a long bout with illness. Blixen’s marriage proved an unhappy one and resulted in divorce in 1921 as well as a battle with syphilis a few years earlier. Despite this, Blixen found her years in Africa to be her most liberating and challenging. After her divorce, she ran the coffee farm by herself and lived alone, a practice fairly uncommon at the time. She speaks of her years in Africa as a relief from her former life: “Here at long last one was in a position not to give a damn for all conventions, here was a new kind of freedom which until then one had only found in dreams” (29). Blixen found herself outside the Victorian world of Denmark and immersed in the aristocracy of colonial Africa. She earned the coveted status of an early settler, a position that gave her freedom and standing in society life. Her writing about Africa filters through this position of social privilege and frames her commentary and description of African natives and the land from a position of colonial authority (see Cecil Rhodes, Gender and Nation). Colonialism, which Memmi describes as “one variety of fascism” (63), is based on economic privilege, despite suggestions of more noble goals of religious conversion or civilization. Its key tools are racism and terror. Racism is ingrained in every colonial institution, and establishes the “sub-humanity” of the colonized, fostering poor self-concepts in the colonized as well. By using terror to quell any reactionary uprising, the colonizers reinforce fear and submission. The colonial system favors population growth. In order to keep the salaries of the colonizers high and their cost of living low, there must be high competition among the native laborers. In other words, the birthrate must rise in order for the system to perpetuate itself. Since all resources go to the colonizer despite the need for increased resources by the growing colonized population, the standard of living of the colonized inevitably goes down. Blixen’s views of the Masai, Somali, and Kikuyu she came in contact with varied widely. The early settlers labeled her “pro-native” while others saw her opinions as aristocratic and condescending. In a 1938 lecture, Blixen describes her feelings for the natives that she encountered: “I loved the natives. In a way the strongest and the most incalculable emotion I have known in my life. Did they love me? No. But they relied on me in a strange, incomprehensible, mysterious way. A stupendous obligation” (34). On the one hand, Blixen portrays the natives as her “obligation,” yet she also characterizes her friendships with them as “heroic friendships” (37). This ambiguous attitude is present in her novels Out of Africa and Shadows on the Grass, and produces conflicting opinions of her work and personal character. Both her stories and autobiographical accounts found harsh and favorable criticism in later years. Many critics began to see Blixen as more than a mere storyteller, but one who could and had shaped views of Africa and its people. In Ngugi’s view, Blixen’s animal imagery degrades the Africans she claims to praise. He perceives her aristocratic outlook to translate into a world in which the African ranks below the animals and below the land. Ngugi finds Blixen particularly insulting because of her educated and privileged place in society. Blixen, he points out, is no uncouth soldier or repressed missionary, but “a refined lady of some discrimination and learning” (19), thereby legitimizing her words. In light of her education, Ngugi believes that her attitudes are all the more abhorrent. Much of Ngugi’s anger stems from what he sees as Blixen’s inability to give the Western world a truer picture of Kenya and its people. Within identical passages, however, other critics dispute Ngugi’s view. They find instead a noble, if somewhat constructed description of Africa and its people in Blixen’s words. Blixen’s narration, then, becomes more of an artificial and artful world created by the author (Johannesson 131). Her stylized portrayal of natives, her animal imagery, translates as a means to provide aesthetic distance from her work (134). In all her tales, Blixen devotes much time to description and fairly stock characters. Africa develops as a mere extension of this view; it unfolds as another tale Blixen tells with embellishments. This criticism seeks to remind the reader that however “realistic” Out of Africa and Shadows on the Grass might appear, it still serves as an author’s reconstruction of a land and people (126). After all, these critics contend, Blixen recalls Africa five years after she left, while in her home in Denmark. Karen Blixen’s legacy includes much complexity and contention. To some, she stands as a master storyteller. Others see her as a writer in a white racist tradition who perpetuates a demeaning portrait of Africans. 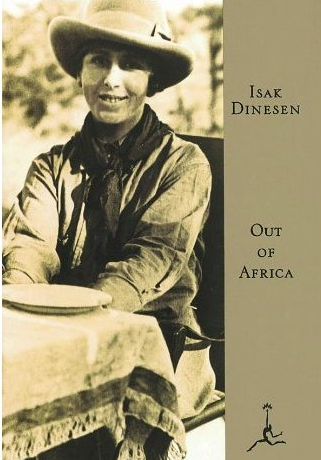 Both Baroness Karen Blixen and writer Isak Dinesen, Blixen leaves a written and personal history filled with widely varied opinions. As postcolonial writers and nations continue their discussion, Blixen will no doubt hold a much debated yet firmly established seat at the table. Dinesen, Isak. Anecdotes of Destiny. New York: Vintage International, 1993. —. Carnival: Entertainments and Posthumous Tales. Chicago: University of Chicago Press, 1983. —. Daguerreotypes and Other Essays. Chicago: University of Chicago Press, 1984. —. Last Tales. New York: Vintage International, 1991. —. Letters from Africa 1914-1931. Chicago: University of Chicago Press, 1984. —. Out of Africa and Shadows on the Grass. New York: Vintage International, 1989. —. Seven Gothic Tales. New York: Vintage International, 1991. —. Winter’s Tale. New York: Vintage International, 1993. Dinesen, Isak. Out of Africa. New York: Random House, 1970. Hannah, Donald. Isak Dinesen and Karen Blixen: The Mask and the Reality. London: Putnam and Company, 1971. Horton, Susan R. Difficult Women, Artful Lives. Baltimore: Johns Hopkins University Press, 1995. Johannesson, Eric O. The World of Isak Dinesen. Seattle: University of Washington Press, 1961. Langbaum, Robert W. The Gayety of Vision: A Study of Isak Dinesen’s Art. New York: Random House, 1965. Ngugi wa Thiong’o. “Literature and Society.” Writers in Politics: Essays. London: Heinemann, 1981.